Richard Wills of Warbird Replicas has produced this kit of a Spitfire that goes together with an ease that can only be described as magical. Having built a few from different manufacturers over the past 1/2 century (EEK) this one is going to be the easiest build to date. 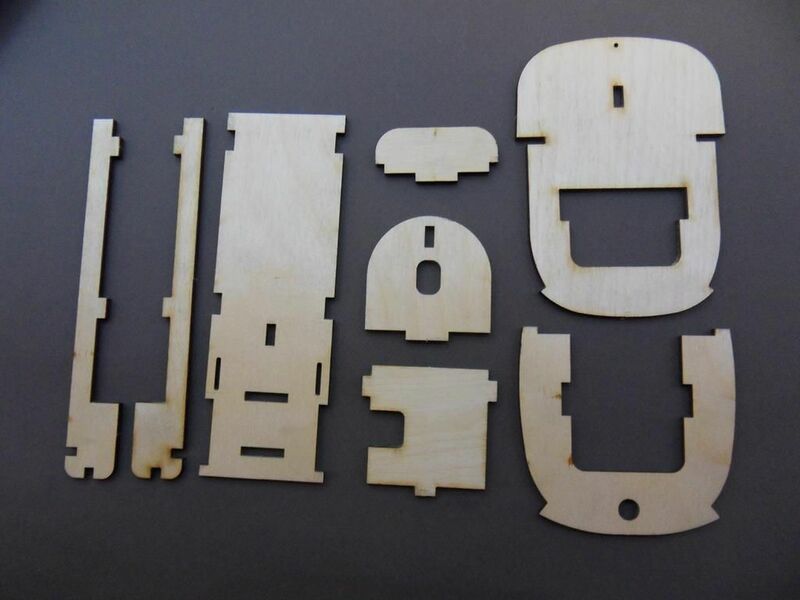 The wood parts are CNC laser cut with such accuracy that the parts all fit snug together with just enough free play to allow positioning. After assembly the structure is held by its jigs whilst CA adhesive is applied to the joints to complete that parts construction. Quick, easy and above all accurate. 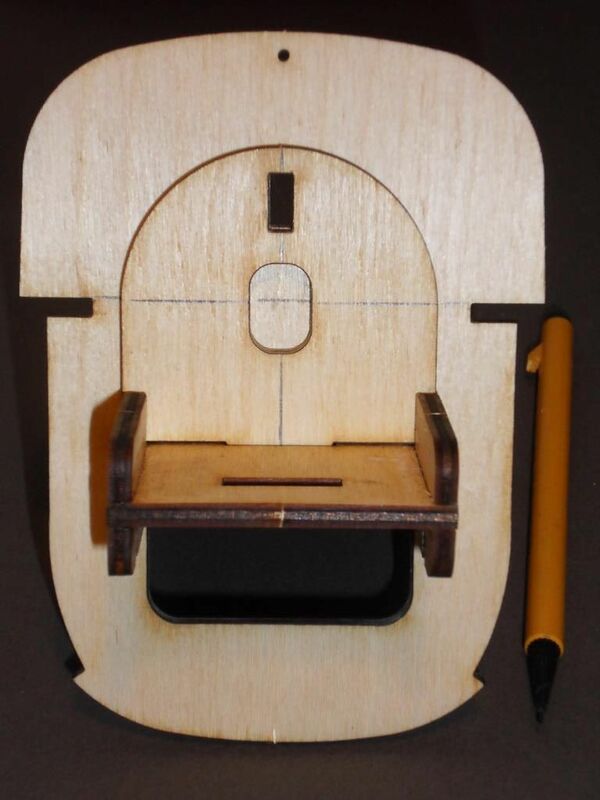 For those reading and wondering if a wood build can be this easy then this is the kit that will show you it is possible! 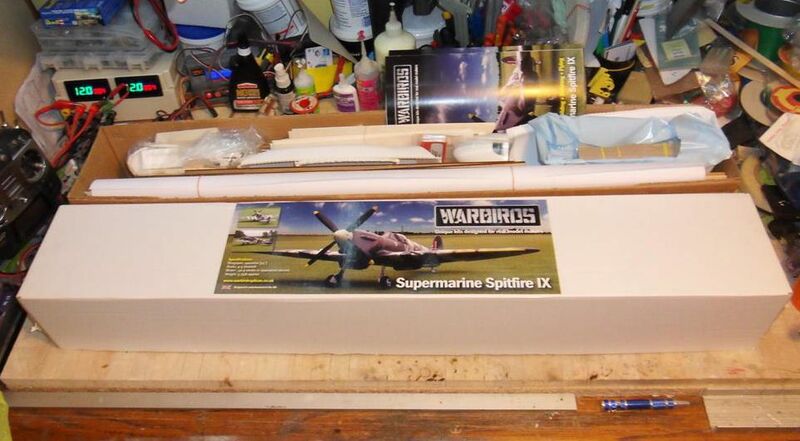 The following is my build of the latest release of the Warbird Replicas Spitfire LF Mk IXc option for electric power. The kit options also has a power version for the OS52 and similar power and many add on optionss to make the kit as basic or complete as you want. The chosen scheme will most likely be one of the Spitfires flown by 457 Squadron "Grey Nurse" RAAF in tribute to those pilots from down under that flew and fought for our freedom. 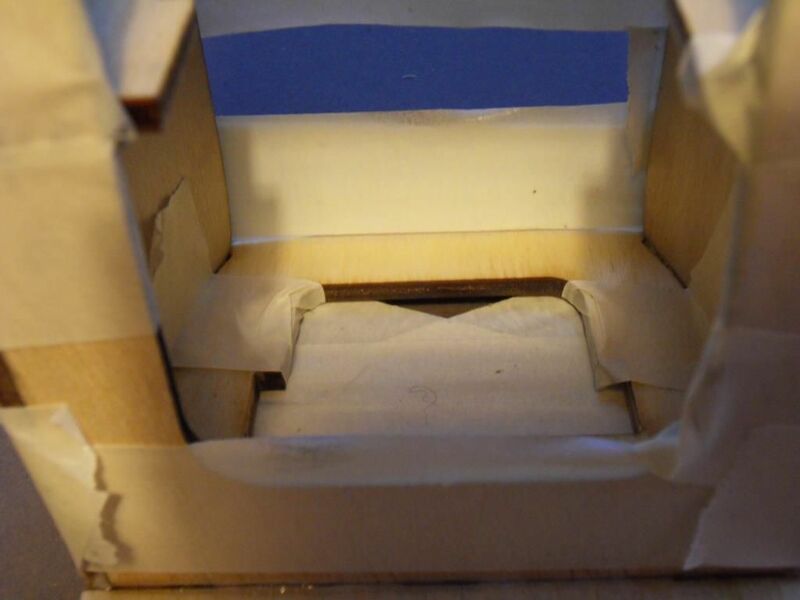 To start the box arrived in quick time encased within a second cardboard box sturdy enough to leave the kit box pristine and unmarked. Opening the box was swiftly followed by a wow that even got SWMBO out off the couch to see what I had made such noise about. 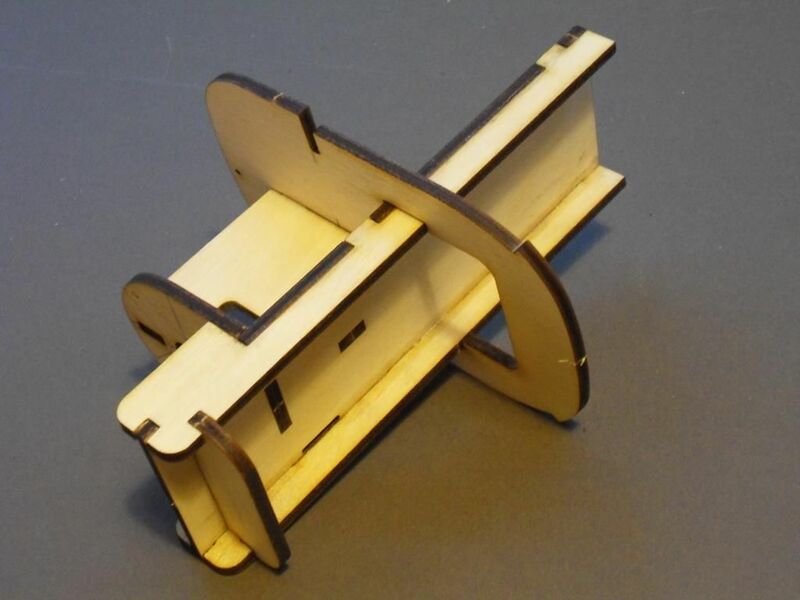 I have been building balsa models now for over 50 years and watched the advances made with keen interest but this kit just blew me away with the quality. The box was full of wood with beautifully thin (@1mm) laser cut parts, ABS mouldings, a substantial pack of small parts and a full size plan with two gloss booklets, one a very comprehensive parts list and the other a full set of building instructions with clear step by step instructions with large clear photos of each step and finally the most gorgeous canopy moulding. This was crystal clear, accurate to shape and protected by a very clingy protective wrapping. The photos should show just what I saw. 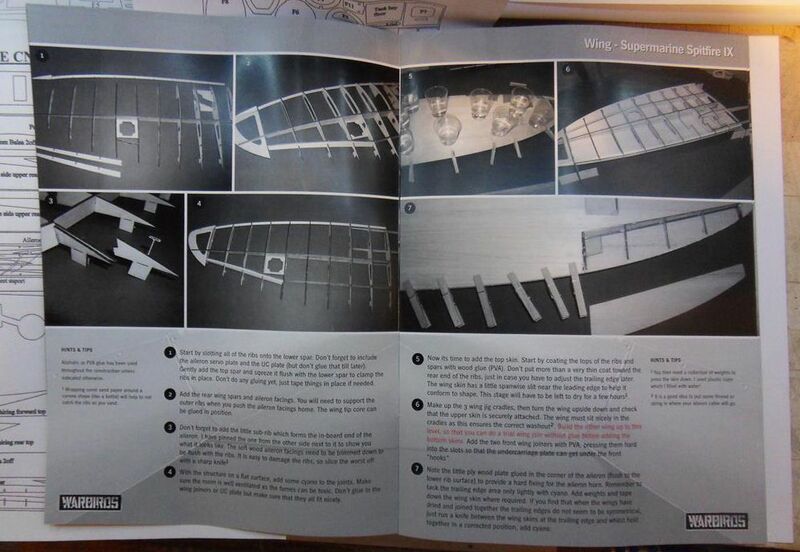 I am starting the fuselage build so the first thing is to laminate the ply doublers to the sheet balsa fuselage sides. I used PVA here spread all over the ply as it is not too porous and allows working time to spread it thinly before placing it carefully in position on both sides. Make sure you do a left and right pair. Easily done to do two of the same side so shade areas to be glued to make it easier. 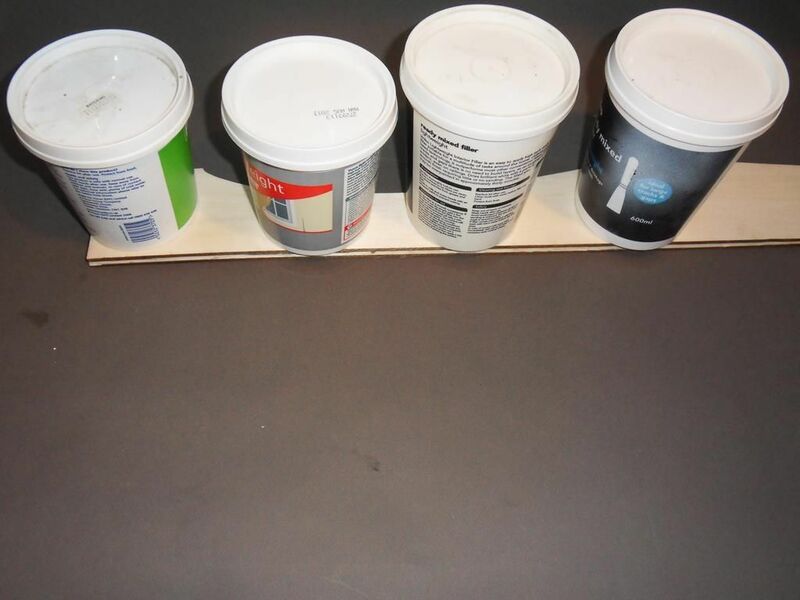 Make sure that the two sides match exactly with a 3mm gap along the top edge and leave them overnight with a heavy weight distributed along the glued areas. Plastic tumblers of water are great for this. Latest today is the motor/ battery mounting. 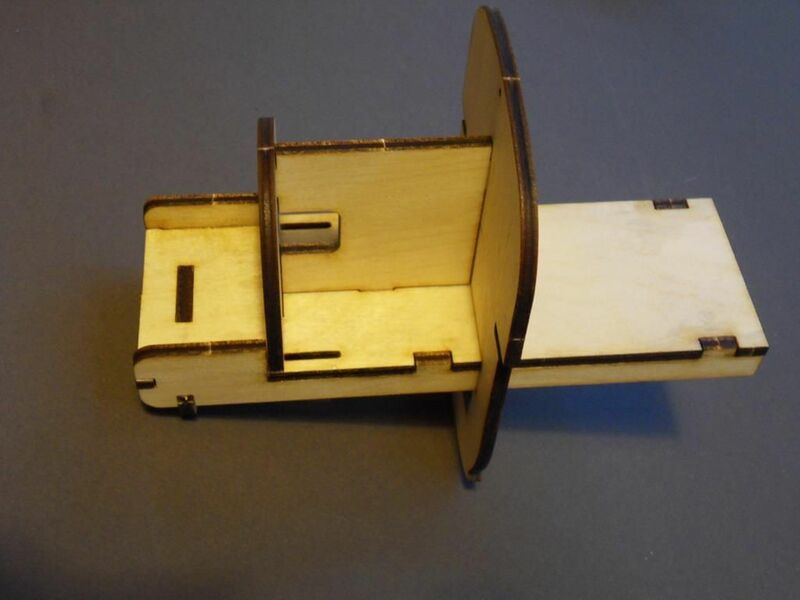 All the parts fit perfectly and after a dry fit are glued with your preference of PVA or CA. I have marked the motor centre line on to the electric motor mount as a reference for fitting later. 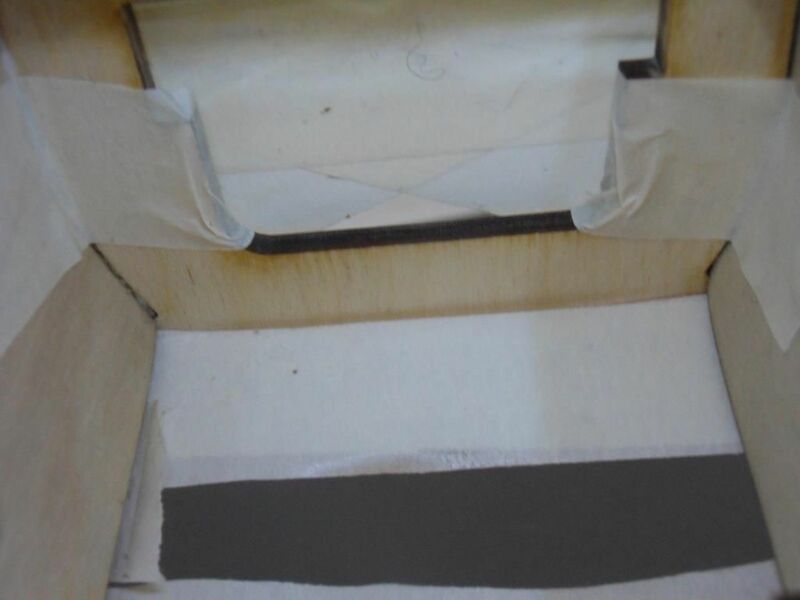 Ensure the adhesive contacts all joined parts and clean off any surplus with a paper towel before it runs or goes off. 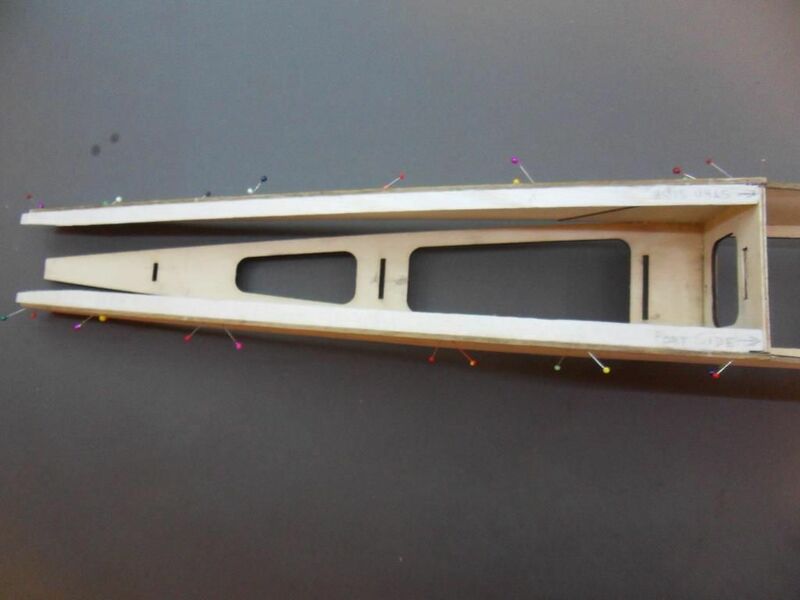 The fuselage crutch has F7 glued in place ensuring it is vertical. looks to be a fantastic kit sir. i will be watching with great interest . Onwards and upwards. 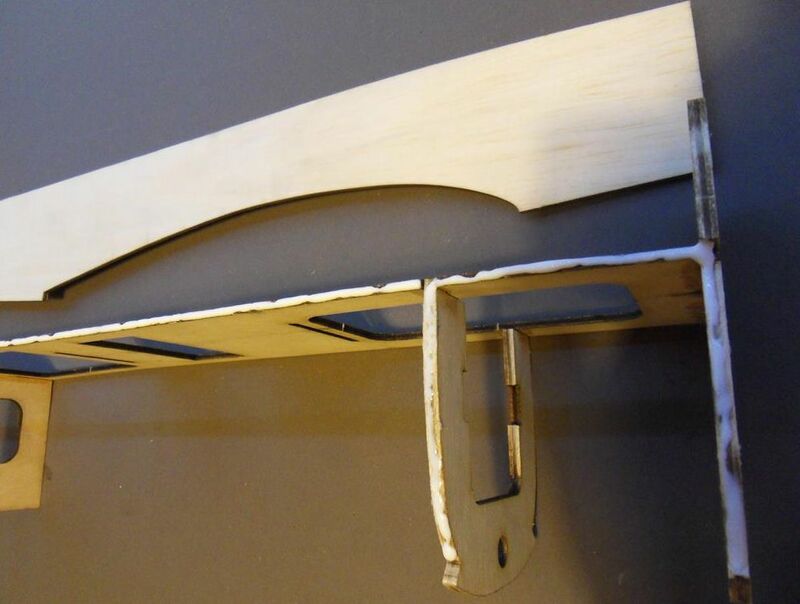 I next glued the front fuselage formers F1, F2 in place making sure that the sides are slightly narrower than the fuselage crutch to allow for the ply doublers. As usual ensure that the formers are vertical to the crutch assembly. 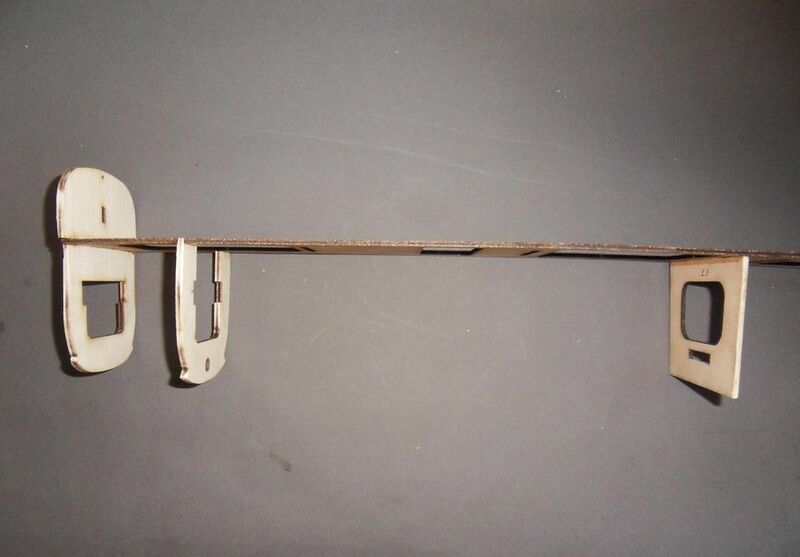 The following is my preferred way of joining the fuselage sides to the fuselage crutch: 1/ Wet the area well where the fuselage sides need to bend to match the former contours. 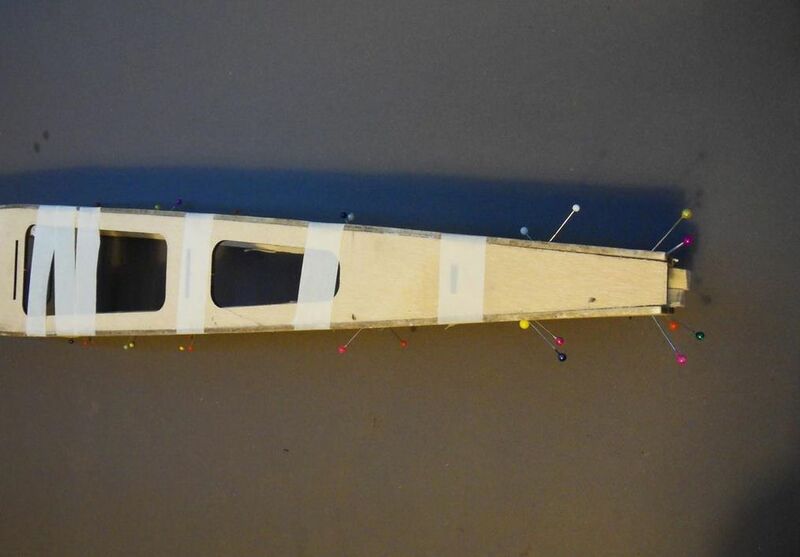 2/ Leave for a few minutes to let the balsa swell and start to bend. 3/ Apply a bead of PVA to the crutch and former which is to be joined. (In this case to just rear of F7 where the rear fuselage starts to narrow). 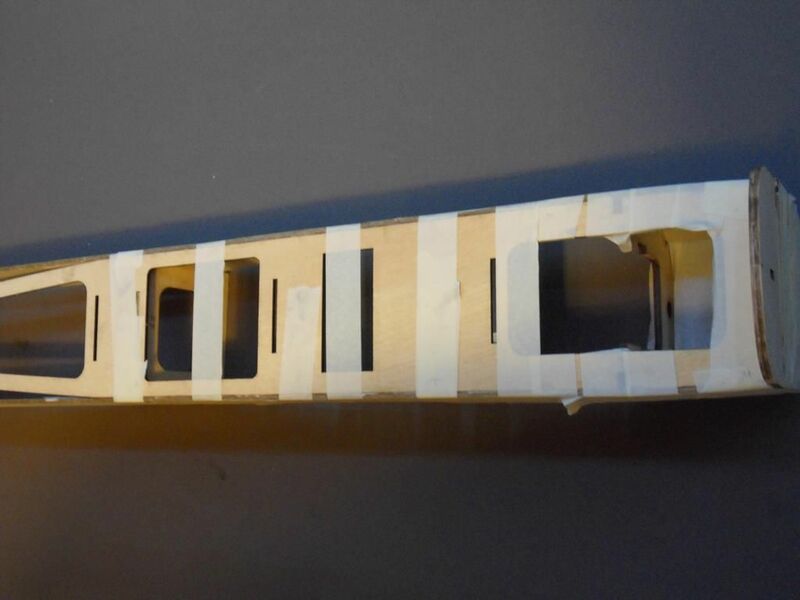 4/ Fix the first fuselage side in position with just a couple of strips of adhesive tape. 5/ Repeat for the remaining fuselage side. 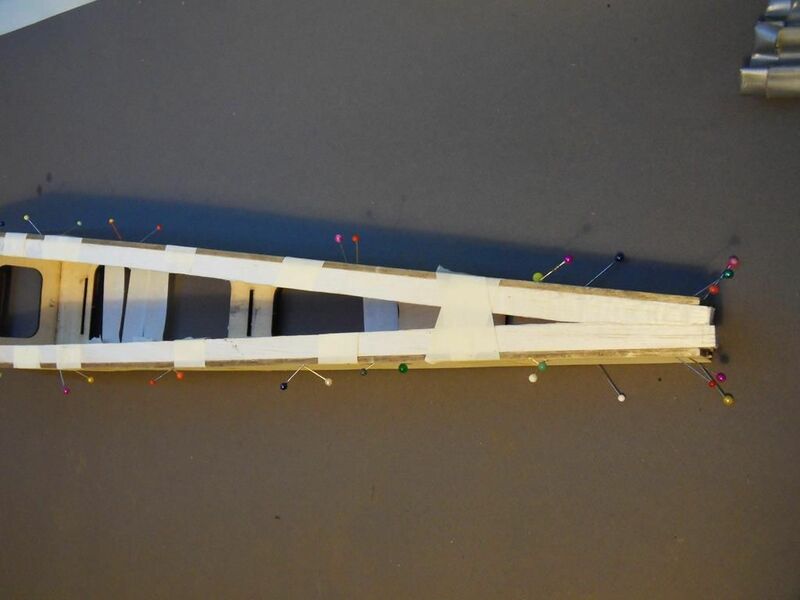 6/ Use as much tape as necessary to pull each side hard into the fuselage crutch so that it rests nicely on top of the ply doubler and the crutch is flush with the top edge of the fuselage side and do the same for the remaining side. Draw the tape across the fuselage to pull the sides hard into the formers F1, F2, F7. 7/ Remove any surplus adhesive and ensure the fuselage sides are flush with the front of F1 and the tail ends are level at the tail. 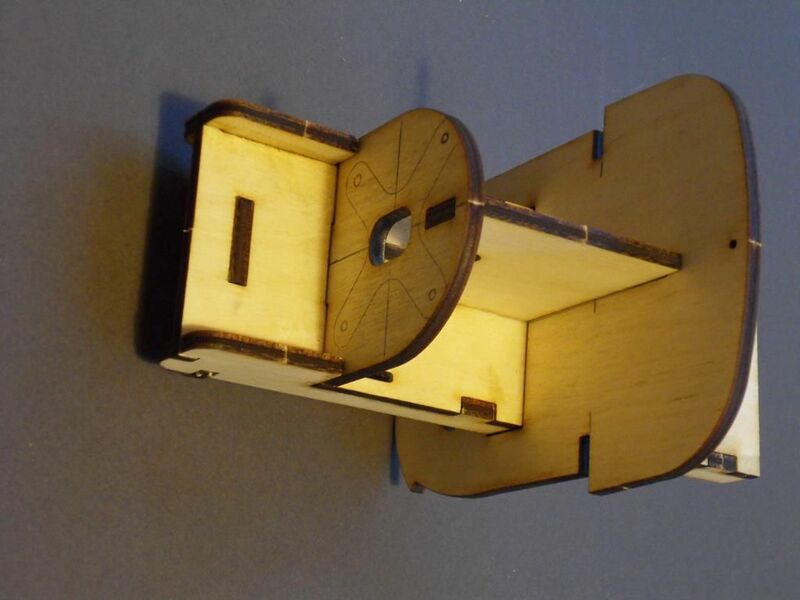 The rear section will be glued to the crutch when the rear formers are fitted. 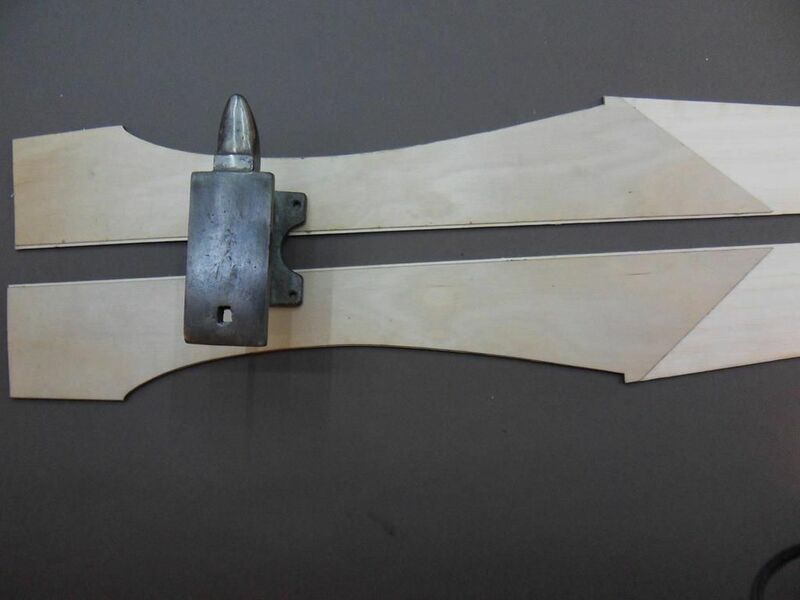 If clamps are to be utilised ensure that some scrap balsa or ply is used to spread the load under the clamp feet and not indent the balsa sides. Many thanks. 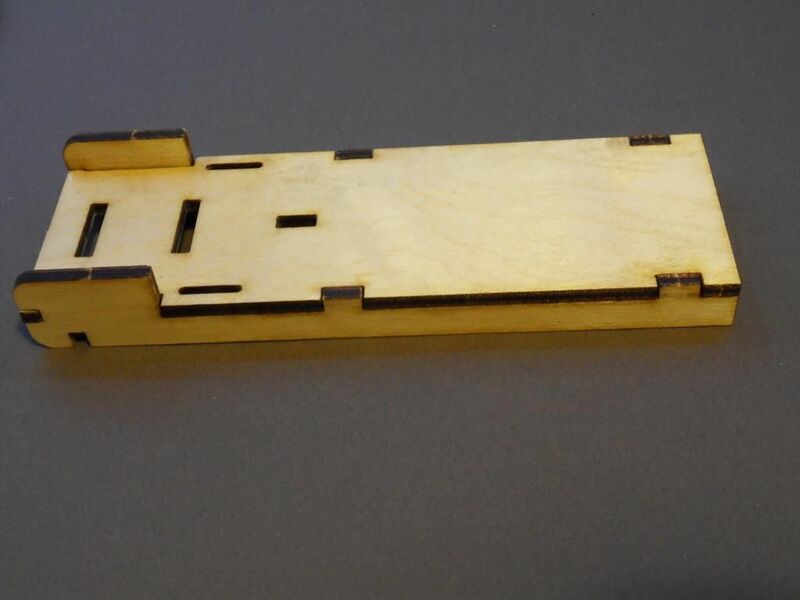 The laser cutting and fit of parts is some of the best I have seen, and the kit in general is superb. I was probably most impressed with the quality of the balsa with top quality wood selected throughout, and is well matched to function. 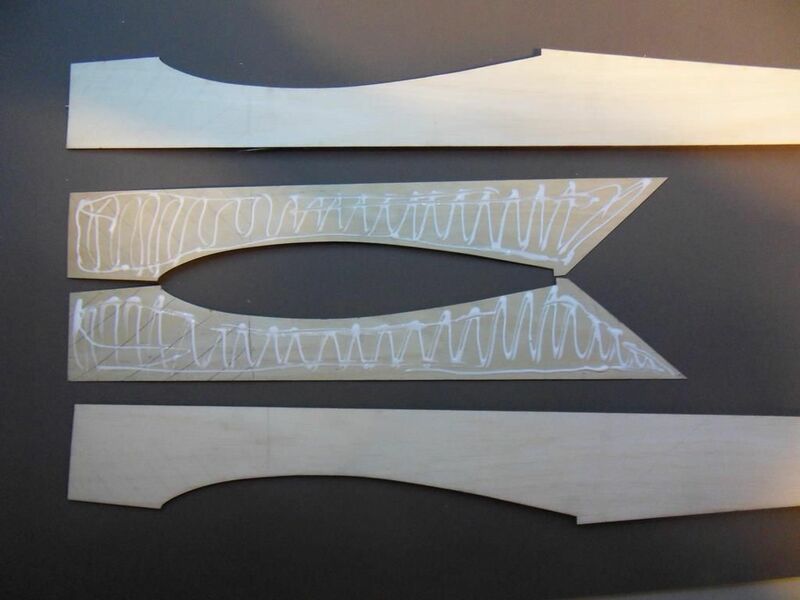 Even the elliptical wing skins are laser cut for you, and the wing is built on its own jig system. 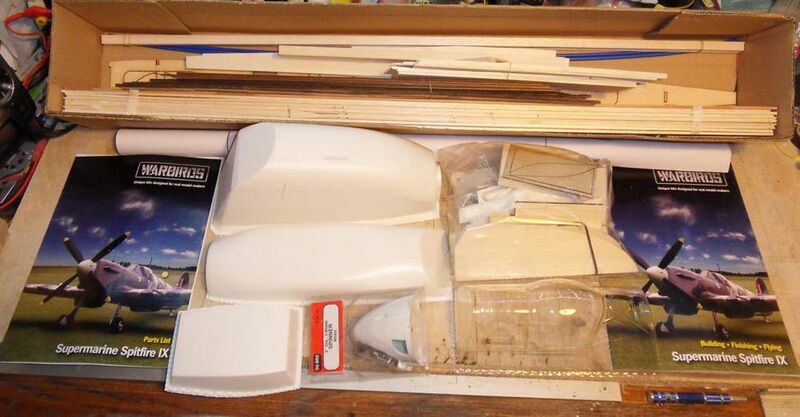 This is quite interesting as I thought all the warbirds kits had foam wings? The hurricane does for sure as I have built 2! it certainly fits well together with no gaps. 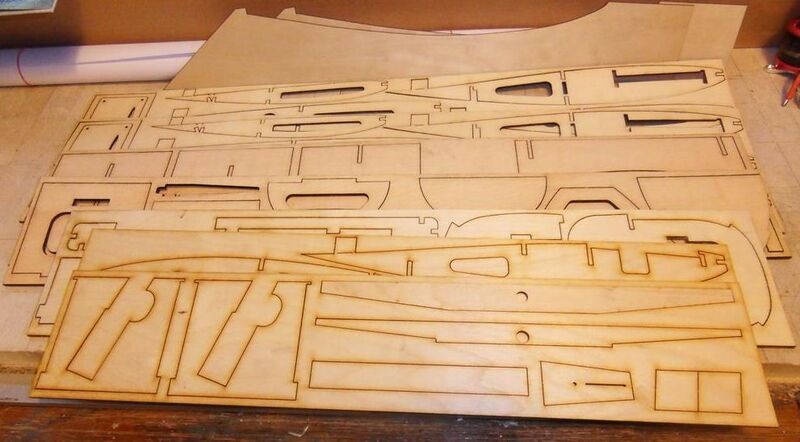 You are correct in thinking that foam wings were the standard, however this Spitfire kit is being produced with a wood wing to satisfy those of us that like wood builds. If Richard reads this then maybe he can enlighten us to what may be around the corner. As far as I am concerned this kit ticks many boxes for me + I am pining for another Spitfire now. The cutting looks superb! 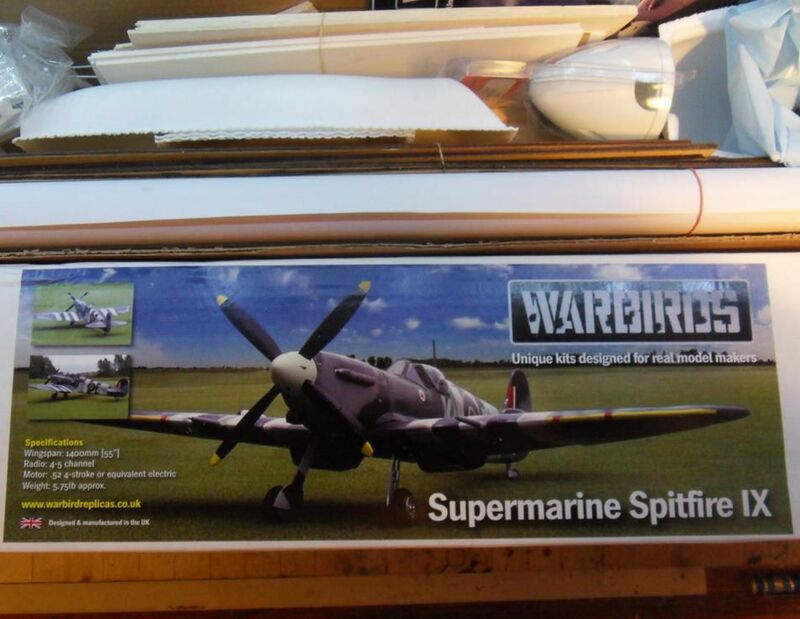 I am building a Cambrian Spitfire which is the same size. I never thought the wing looked right on the WR one but the new built up wing has been redesigned according to the website so I am sure it will be excellent now. Good to see the warbird replicas site updated, I emailed about their oleos for my Cambrian Spitfire but got no response, I might try again now there is some action. Thanks for putting this one up Ady. Brilliant and what's more your choice of a "Grey Nurse" Australian is right up my street. The other options I'd consider would be PRX or XI. This kit looks wonderful. Hi CS, Colin, All. Thanks for the kind replies. This kit does deliver on quality and makes the build so much nicer. Not much to report I'm afraid. After getting home from my work SWMBO had the evening marked for shopping but progress has been made. The following takes less time than is spent writing it up!. 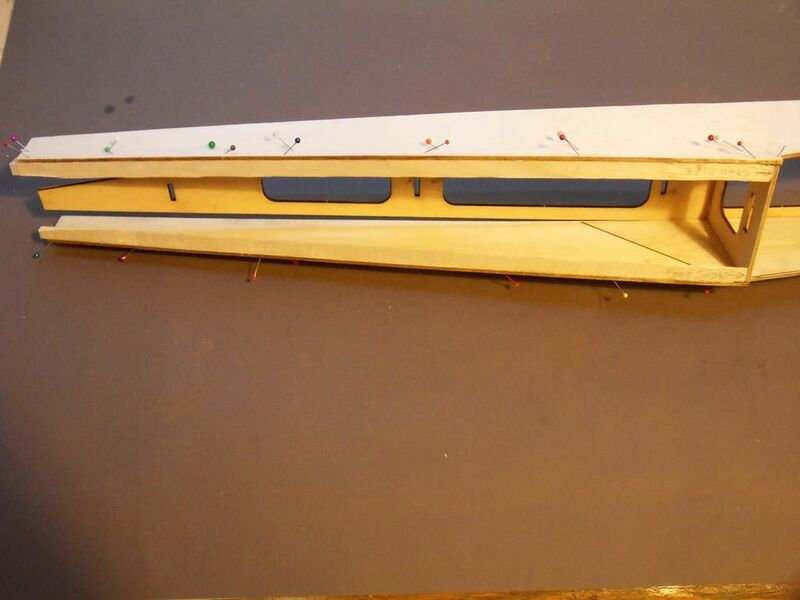 In my rush to affix the fuselage sides into place I forgot to add the 1/2" triangular section to the lower rear sides. It has not impacted the build as they can be fixed in place easily so could be left to this stage if wanted. 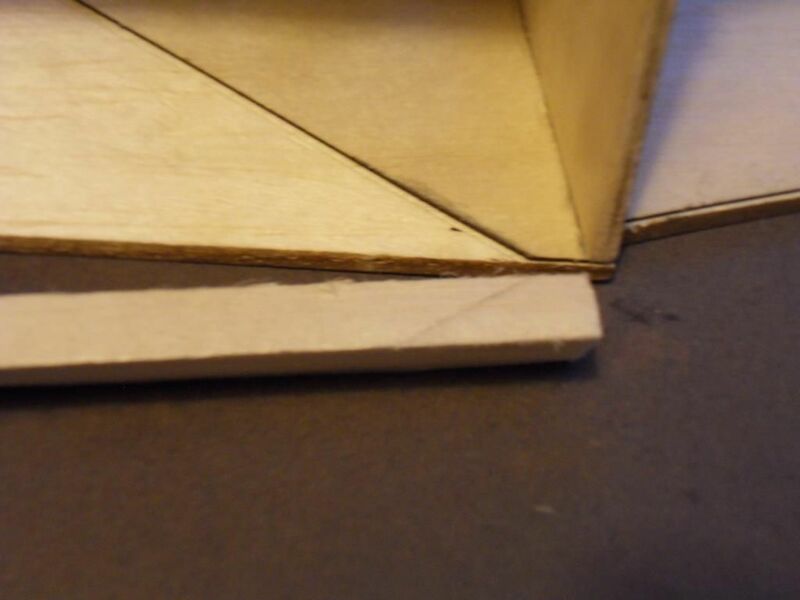 The only tricky bit with the fixing is the cutting out of the end of the triangular section to position over the end of the ply doubler. 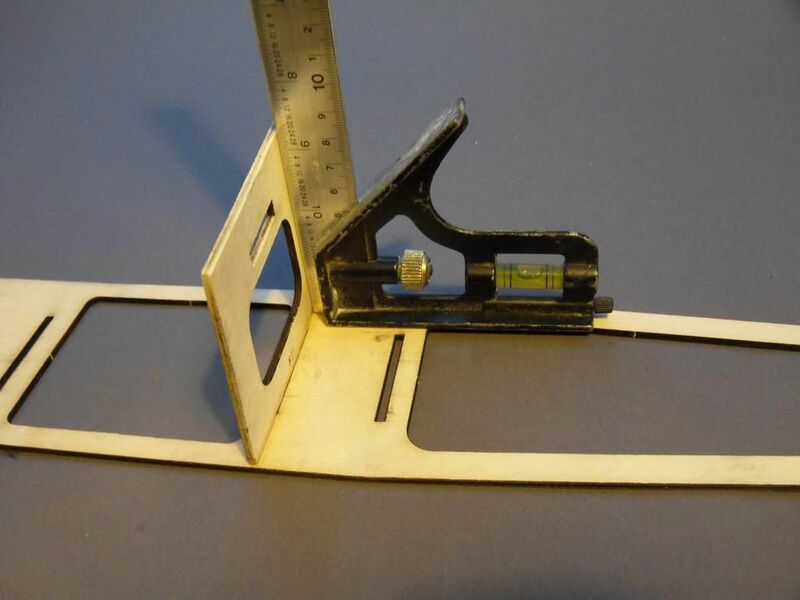 Simply put the section of strip in place and press down hard so that the ply edge leaves a line in the balsa section to show where it lies. 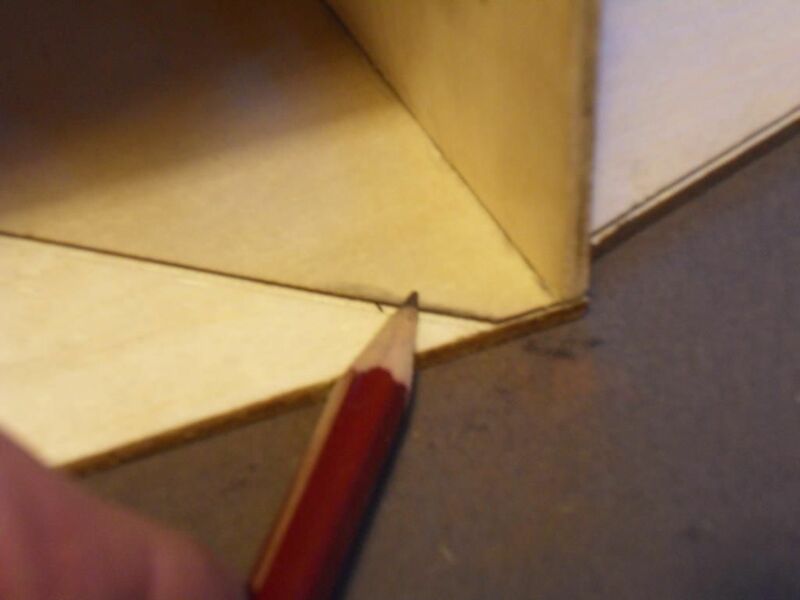 If the line cannot be seen then rub a soft lead pencil along the corner of the plywood as shown in the pic and when the section is pressed down will leave a line on the section. which can then be cut out so the section fits well. 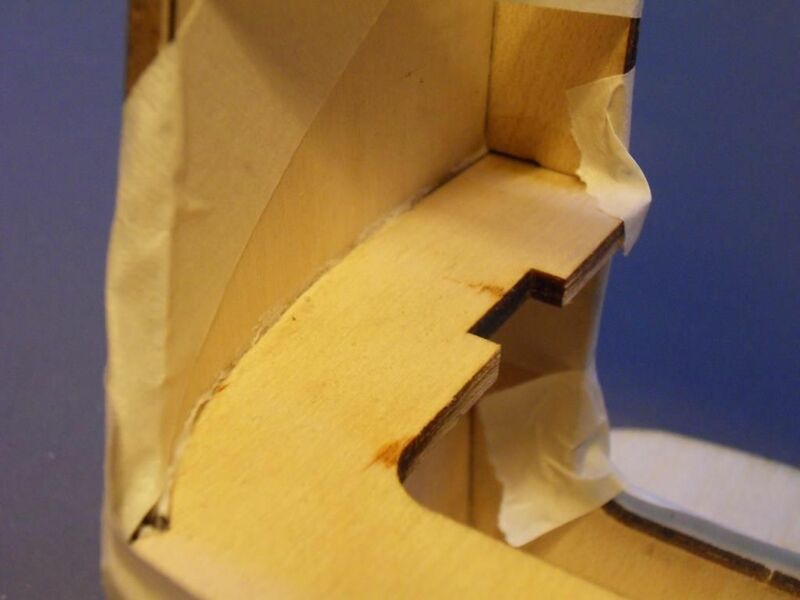 Next simply glue the triangular section to the sides ensuring they fit snug over the ply doubler and butts against former F7. pin them to the sides and allow to set. 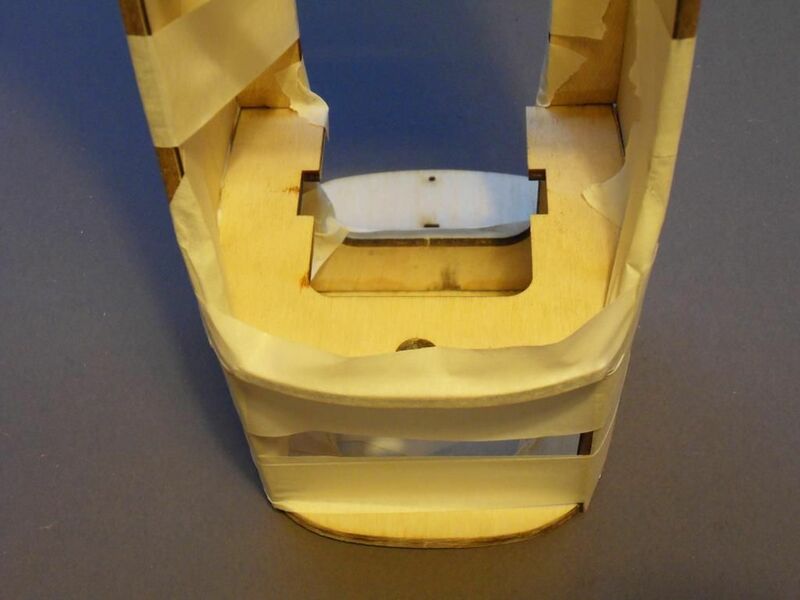 When set the sides can be glued to the fuselage crutch ensuring the crutch is fixed level with the top of the fuselage sides. 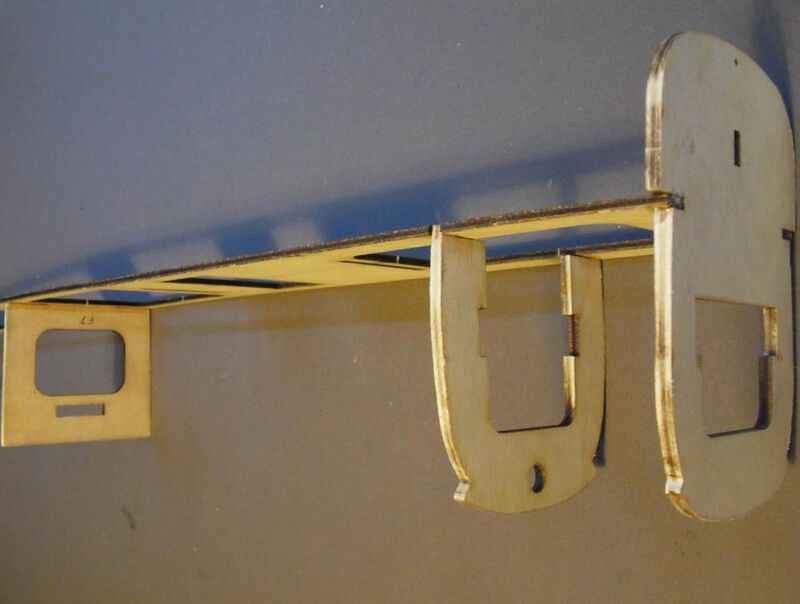 Secure with pins/ tape/or clamps until set. 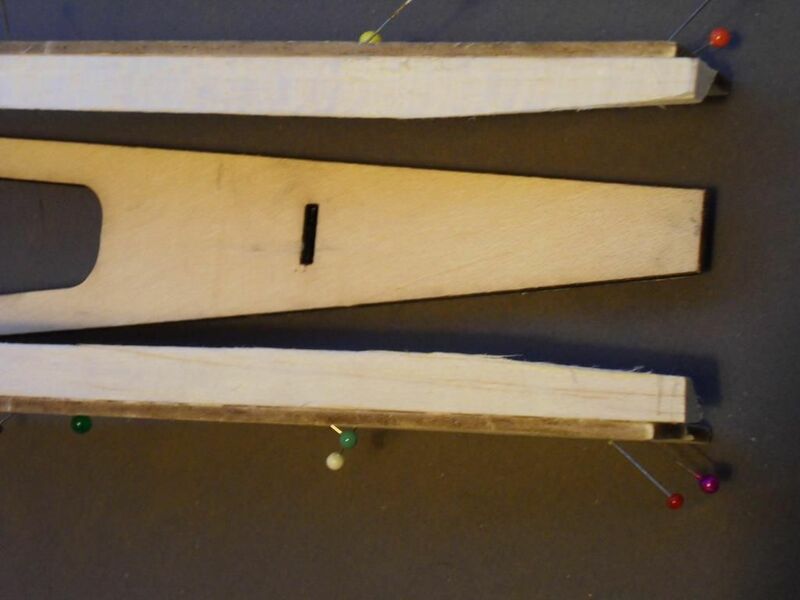 Finally the inside edges of the triangular sections can be sanded to allow the rear fuselage taper to match the top. Thanks for sharing, it looks wonderful and building seems so pleasant. I will follow with great accuracy (and would be very interested in some weight report). Looks great, always liked the look of these kits. Yes, looks great Ady, went straight to the website to order only to find it's out of stock. Ady, I almost wish I hadn't read through this thread, I have 4 builds on the go and not really making any headway with any of them, but I really want one of these. I will probably just place an order for when they are back in stock, hate waiting for anything, I have no patience what so ever. Want it and want it now! It even looks impressive just from the photos. Can't wait to become even more of a recluse in the man cave. This looks too good to pass by. Thanks! I just downloaded the build instructions from the website, Ady is right, very impressive. Possibly the best I have seen.